Graduation candy bars are a great way to thank your guests for celebrating with that special graduate! 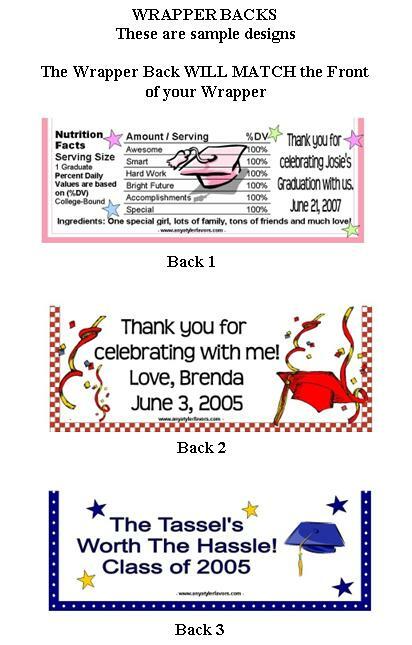 Whether it's a preschool graduation, graduation from kindergarten, high school graduation, or graduation from college, we have the perfect candy bar wrapper for your party. Great for putting at place settings, or on a candy table. Order the CANDY BAR WRAPPERS ONLY. We provide the SILVER FOIL underlay FREE! Your order will come with the foil sheets and PERSONALIZED WRAPPERS! *This is for the do-it-yourselfer. We do NOT provide the Hershey candy bars!! *Our wrapper/foil combo will fit 1.55 oz "Regular" Size Hershey's® bars! *Assembly is required by customer *To sum it up: YOU buy the chocolate bars, YOU wrap bar with silver foil provided then wrap with your adorable personalized wrapper. Order the fully WRAPPED CANDY BARS. We will do the work for you! 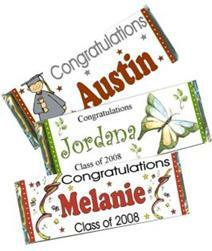 Your Graduation Candy Bar Favors will arrive to you all ready to hand out to your guests.